Milk contains natural emollients and vitamins, such as vitamins A, D, E and some B vitamins, along with amino acids, enzymes, unsaturated fatty acids and zinc as well as triglycerides that moisturize the skin. Milk soaps can be very soothing to your skin. No fragrance, no color, just pure, gentle milk soap. A most scrumptiously delectable honey fragrance. This has got to be one of mine and my customers all time favorites and I can hardly keep it in stock. A rich blend of honey sweetness that is simplyheavenly. Made with pure star anise essential oil or Chinese star anise. Star anise is a native evergreen shrub of China. Star Anise essential oil is steam distilled from the star-shaped seeds. 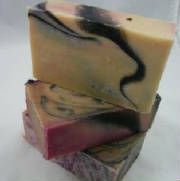 Not only is it used to flavor black licorice candy but it is also excellent for getting strong odors off of your skin. Fresh, vine-ripened raspberries and blackberry mixed with warm vanilla goodness. Overall, it's sweet, silky and mouth-watering. A bold bouquet with hints of lavender, this soap will fill your senses with the aroma of a full summer graden on a warm evening. This blend is a perfect marriage of oatmeal, milk and honey - mellow, soothing, with just a hint of sweetness - the comfort food of soap scents. Add a refreshing cool peppermint and vanilla cream jump start to your day. This cool mint scent mellowed with a white vanilla bean fragrance is an amazing energizer. A very vibrant fragrance! With notes of cactus flower and clementine, blackberry, and vanilla orchid. Base notes of white amber and pimento. Makes every lassie feel sassy! Sweet Pea & Rhubarb is a delightful sweet pea fragrance with hints of tangy rhubarb fruitiness that really make the sweet pea floral 'bloom' magnificently. Tea Tree Oil has long been recognized for it's many health benefits. Homeremediesweb.com is a great place to check out a few. I added wintergreen essential oil simply to compliment the tea tree smell.